Marlene Young Nungurrayi was born in 1973. Her main Dreaming stories include important women’s dreamings and their associated body paint designs. 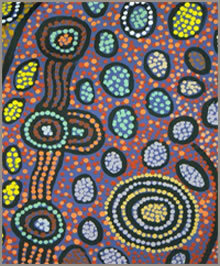 Marlene’s use of bright colours is one of her trademarks coupled with thick layered paint, distinctive of the Kintore region. 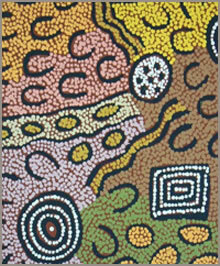 Marlene’s paintings depict the journey path of "Kungka Kutjara ", travelling women and their journey towards the site of Munni Munni (south east of Kintore). Marlene Young Nungurrayi is married to Adrian Young Tjupurrula. 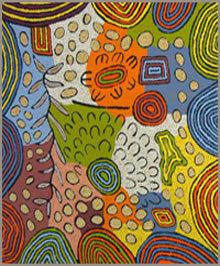 Her father was famous Tommy Lowry Tjapaltjarri and her adopted father is famous Doctor George Tjapaltjarri. In turn, these family members are connected to several famous artists including Nosepeg Tjupurrula, Fred Ward Tjungurrayi, Turkey Tolson and many others. F. 02 9555 2806 E.